"Jim Merz built bike frames in Portland, OR from 1973 until late in 1982, then he shut down his shop and went to work for Specialized as a designer. Merz could build a track or 'cross bike, and built superlative road racing bikes, but touring bikes were where he stood out. He made bikes with tubular steel racks--generally shorter and quicker steering than most other touring rigs of his time--and matching panniers also made in Portland." 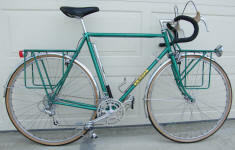 "Jim started riding a Campagnolo equipped bike in 1964, just after high school. Jim worked as a machinist and taught himself frame building from his metalworking background. He opened his own shop at NW 21st and Everett. Over 400 frames were produced, using Columbus, Reynolds 531 and 753 tubing including two 753 frames (He was the first USA builder certified to use 753) for pro rider George Mount. Merz used BCM lugs and crowns, finished seat stays with flat tops a la Schwinn Paramount, and decorated the bikes with simple graphics and paint. His painter was Virginia Church." "To this day, many Portland bikies consider Merz machines in high regard, even the best bikes ever made. Jim was a resident of Bainbridge Island, WA, working for the Browning company, until his recent return to Specialized as their "Master frame builder". wheels are 700c. Even he bar tape is original. The bike is my size!" where Jim worked as the master frame designer.